Dubai: He is still savouring the happiness of what happened two days ago in Riyadh — his meeting with the Acting Governor, Prince Mohammad Bin Sa'ad Bin Abdul Aziz, and the latter's unstinting support for his walk when another wave of happiness engulfs him. Yesterday, Jalal Bin Thaneya was informed that His Highness Shaikh Mohammad Bin Rashid Al Maktoum, Vice-President and Prime Minister of UAE and Ruler of Dubai, tweeted about his efforts. The tweet said, "Proudly observing the young Emirati Jalal @binthaneya, who started a journey on foot to Mecca in support for people with special needs. 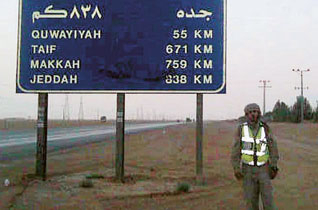 "I am very happy," says Bin Thaneya, who is now a considerable distance out of Riyadh and walking towards Makkah. "It provides me with a new burst of motivation," he says. "Coming from the Ruler of Dubai, it means a lot." Two days back, on Day 27, Bin Thaneya's fund-raising walk came to a temporary halt when a Saudi police officer stopped him a few kilometres outside Riyadh, prohibiting him from walking any further. After mediation by the UAE Embassy in Riyadh and a meeting with the Acting Governor of Riyadh, he was allowed to continue his walk, with a special order being issued by the latter to all military personnel and police in the province to allow him unrestricted access on his journey to Makkah. Though he has been set back by two days as a result of this incident, Bin Thaneya's concern about the loss of time is being offset by the support he is garnering. Shaikh Mohammad's tweet is definitely putting a new spring in his step. "I usually do about 45-50km a day but for the next few days, I will have to do about 60km to make up for the lost time. It won't be easy, in fact it will be downright painful, but I will have to do it," he says. Meanwhile, Roula Farah, PR Coordinator of Dubai Centre for Special Needs, which is the beneficiary of Bin Thaneya's fund-raising walk, says the support for the walk has been good so far. "We have been getting a lot of response. People are calling to enquire about how they can volunteer at our centre. A lot of donations have come through as well." The total sum raised so far has not yet been determined "but by next week, we will be in a better position to know the figure", she says. The Centre is eagerly awaiting the completion of Bin Thaneya's walk and his return to Dubai. "We have a very special welcome awaiting him. Our students will spend the whole day with him. We are even having a special choir for the day." The Centre has been updating the news on Bin Thaneya's walk for its students all through on its bulletin board, along with posts on its Facebook page.